Rory McIlroy will be able to give full reign to his extraordinary golfing talent in Australia today and leave this legal concerns aside for a while. Not that his case against Horizon Sports Management and others has bothered him too much this year. After all, the 25-year old was doubled his haul of major wins, returned to world No 1 and captured the European Tour's Race to Dubai, Player of the Year honours on the PGA Tour and two other huge wins in the WGC Bridgestone Invitational and the BMW PGA. While eight weeks have been set aside for the full hearing of his case against Horizon in the Commercial Court from February 3 — theoretically taking the case right up to the end of March, less than a week before he bids for the final leg of the career grand slam at the Masters Tournament — Horizon Sports' will have to wait a little longer to pursue a number of motions relating to the discovery of documents due to be heard in the Commercial Court in Dublin this week. 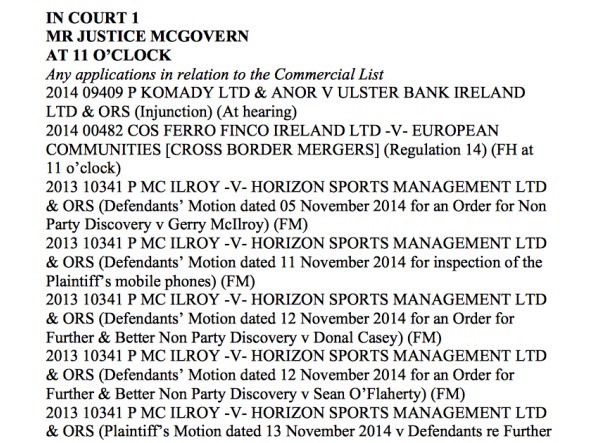 The motions relate to the discovery of evidence on electronic devices held by McIlroy, his father Gerry, Rory McIlroy Inc staff man Sean O’Flaherty and its CEO Donal Casey during the nine-month period leading up to the founding of Rory McIlroy Inc and of the launch of litigation against Horizon Sports Management and others in September last year. The entire case could rest on how the judge rules on McIlroy's claim that the agreements with Horizon should be rescinded because he was inexperienced and without the benefit of independent legal advice when he signed his contracts with Horizon. While Horizon claim that McIlroy was urged to take independent legal advice and declined, in remains to be seen if that will be enough given their responsibilities to the golfer as a client. Therein, some legal minds would have it, lies the nub of the case. With legal fees on both sides already running into the millions and with the likelihood of an explosive court case involving a major public figure becoming more likely as time marches on, the only winners for now are the legal profession and the media. Golf fans, meanwhile, continue to enjoy McIlroy's amazing talent on the golf course. The Co Down star is currently defending his title at the Emirates Australian Open — Live scoring — at the Australian Golf Club in Sydney, which was redesigned by Jack Nicklaus in the late 1970s. The consequence is now the modern professional game is played through the air and it was Nicklaus himself who heralded the arrival of the modern power game. In his time few played with such power but now it is a mandatory element of success on the tour. Unsurprisingly his courses reflected the way he played golf and advantaged those who played best his preferred from of the game. If Peter Thomson at his flying best was playing this week the suggestion would be his style was wholly unsuited the demands of the modern Australian course. Greg Norman in contrast would be the overwhelming favourite. Rory McIlroy is the finest driver of the ball since Norman and consequently is the one most likely to win but Adam Scott is always a hard player to beat at home. Mind you McIlroy now lives in Florida and will have been well pleased by what he found when he arrived this week. It is hard to think of a local course more suited to his incredible game. 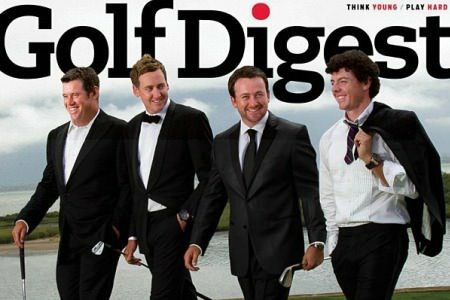 McIlroy tweeted a link to the latest US edition of Golf World recently. 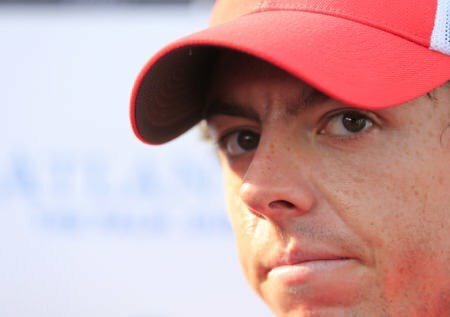 Other stories he’s not so happy about.Rory McIlroy today gave Paul McGinley yet another vote of confidence and called for the Dubliner to be given the task of taking leading Europe against Tom Watson’s USA in Gleneagles in 2014. After also using his Twitter account to confirm “for the record” that he believes Darren Clarke should get “a go” in 2016 and then revealing how he’d just had lunch with Jack Nicklaus, his management company issued a statement to shoot down a story claiming he’d doubled an agreed appearance fee to play in the Australian Open.